Enabling Sustainable Transition to a Biobased Economy – The BioWiseTrans Network meets for the 2nd time in Hamar. 18-20 June, BioWiseTrans partners Nordregio, NIBIO, LUKE, Oslo University and Karlstad University came together in Hamar and sorroundings for its second workshop. Like last time and importantly, different stakeholders from Norway, Sweden and Finland joined us. The excellent program set up by Norwegian partners focused on the need to address and study conflicts and synergies in the ongoing transition towards a fully biobased economy. Foremost focusing on forests, the group of 15 researchers and practitioners jointly experienced and discussed balancing goals of economic uses (e.g. production), social uses (e.g. recreation and tourism) and environmental concerns (e.g. conservation, restrictions and regulations). 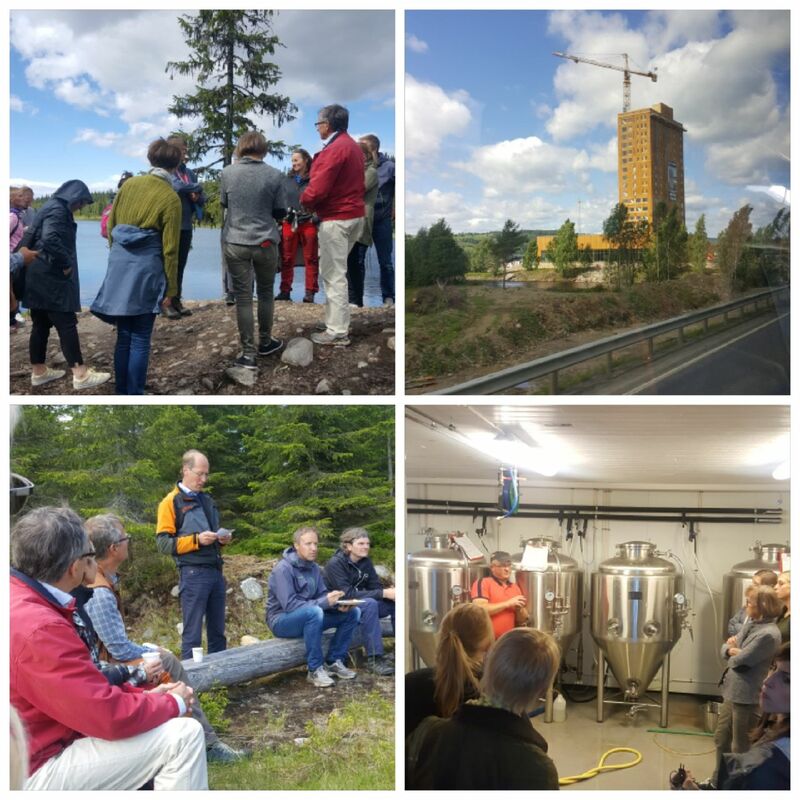 Discussions were also fuelled through the bioeconomy strategy in Hedmark, county and municipal planning, usages of common land for forestry and grazing, outdoor life and forestry, second home developments, and a visit to the gene bank of the forest seed centre. It is clear that the biobased economy consist of both new and old land uses within forests, agriculture and fisheries. To adopt governance and management practices to the current land, water and resource uses, it is important to use sustainable development as a basis. The governance structures in place together with local participatory processes have been more or less functioning for decades (not without conflicts and dialogues however). In the current transition process it is therefore important to ask the following questions: What to sustain? What to develop? In addition to thought provoking discussions, the group also enjoyed a tour to the tallest wood building in the world, the beautifully and innovatively restored dome in Hamar, and dinner with a Napoleon touch and some farm produced beer. One of the most vivid memories remain from visiting the Åstdalens forest associations by the book example of management of the common land (with reference to Elinor Ostroms theories on common resourse use). The head of the board told the group about the ongoing negotiations between the land owners about how many cattle heads are going to be allowed per farm unit. A research project in the area also indicates the synergies between clear cuts in forestry and agriculture, as the cattle tend to prefer to graze on the clear cuts. This shows that there is no need to transform anything that is functioning. The BioWiseTrans network also discussed its final conference to take place in Karlstad 27-28 March. Stay tuned for any updates in this regard.